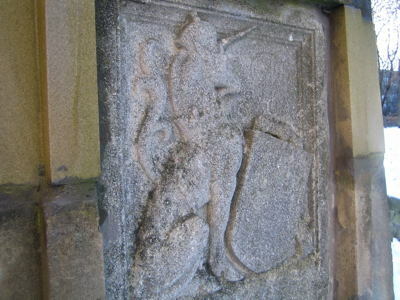 The land of Canonmills, so named after King David 1 had the mills built for the vassals of the Augustinian canons of Holyrood, later became part of the extensive property held by Heriot’s Hospital. As late as 1850 it was a rural area with bleaching grounds, orchards and corn fields. 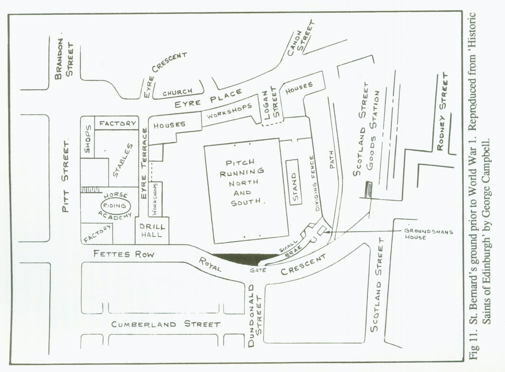 Post Office Directory map of Canonmills from 1846 (City of Edinburgh Libraries)The park lies in a hollow to the north of what is now Fettes Row and Royal Crescent. The hollow was once the site of Canonmills Loch, which gradually receded leaving a marshy area known as Canonmills Haugh, until, by the end of the 18thc. the loch occupied the area now (roughly) taken up by the Yard (Scotland Yard Adventure Centre). The loch was finally drained in 1847. The loch was fed by two mill leads (or lades) taken from a stream which had been diverted from the Water of Leith at Stockbridge. In Ainslie’s Plan the lead which followed the curve taken by Royal Crescent is called the Old Mill Lead. The more northerly lead flowed into the loch across what is now the junction of Dundas Street and Brandon Street. In 1842 when Queen Victoria visited Edinburgh a triumphal archway and public grandstand were erected across the lead at this point. Here the city fathers were due to meet her and grant her the Freedom of the City. Unfortunately, they had been taken by surprise by her early morning arrival at Granton and were not there to greet her. By the time the royal procession had swept without stopping past the queen’s loyal if baffled subjects in the grandstand, news had reached the city chambers and a pack of flustered councillors and their ilk had cast dignity to the wind and was clattering pellmell down the hill, with the Royal Company of Archers, the queen’s bodyguard in Scotland in their van, in a vain attempt to reach the scene appointed for the ceremony in time. It was reported that on this occasion the queen WAS amused. The loch was only 4 feet deep but it provided sport for wild fowlers and coarse fishermen, although the size of bags and catches would probably have been affected by accelerated industrialisation during the late 18th and early 19th centuries, when the pollution leaching into the loch from the mills along the leads is likely to have increased. The other sporting activity carried out on the loch was curling. Canonmills Curling Club claimed to be the oldest of its kind and it was certainly older than the Duddingston Club which was established in 1795. 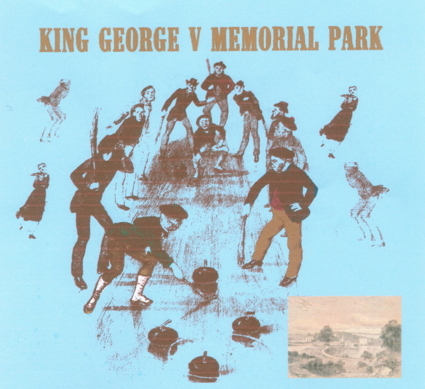 At some point during the long process of draining the Nor’ Loch, the site of annual matches involving the city’s dignataries, the venue was switched to Canonmills and a ceremonial procession of magistrates and councillors made its way down to the loch to the tune of “The Curlers’ March”, one of the “Songs of the Curling Club, held at Canon-Mills”, published as a collection in 1792. From the loch a single lead flowed on down into the Water of Leith to the east of Canonmills Bridge. This lead supported paper mills, tanneries, a distillery and a playing card factory. A last mill building survives on the corner of Canon Street and Eyre Place. Robert Louis Stevenson, born in nearby Inverleith Terrace, with his early years spent in even nearer Howard Place and older childhood and adolescence in not so distant Heriot Row, knew the area well. In “Catriona” he has David Balfour spend the night beside the loch before setting off to walk along the coast of the Forth to keep a rendezvous with Alan Breck Stewart at Yellowcraig, before Alan’s departure for France. 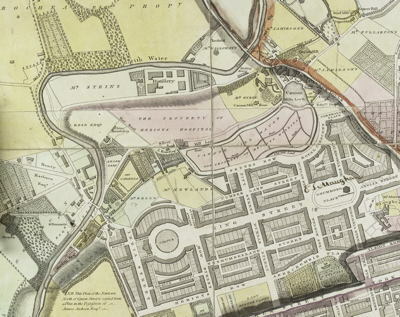 In 1842, five years before the loch was drained, the south eastern corner of the haugh had been taken over by the Edinburgh, Leith and Granton Railway Company. With the aim of taking passengers from the ferry at Granton up to the city centre, track was laid and by 1847 a tunnel had been built. It led from Canal Street Station (a station at right angles to what is now Waverley Station and so called because an extension to the Union canal was planned to pass through it linking with the Forth). The filled in entrance to the tunnel can still be seen, duly identified, on Platform 19 at Waverley. The tunnel ran north under Dublin Street and Scotland Street, emerging briefly into the open before entering the Rodney Street or Heriothill Tunnel. Passengers could join the train at this point but the main purpose of the halt was to permit the uncoupling of the engine and the attachment of the carriages to a hauling system using 150mm thick steel cables to winch it up the steep 1:27 gradient to Canal Street. At that end, for the return journey, the train would be attached to two brake wagons. An uncoupled engine bump-started the train from behind and the two brakesman pulled hard on the powerful hand brakes to control the speed of the descent. They did well; no accident ever occurred. However, the manpower and maintenance costs of using the tunnel became prohibitive and it ceased to be used in 1862, a mere 15 years after it opened.. The station became a goods yard and almost exactly 100 years later even that use for the site came to an end. The Scotland Street Tunnel served a variety of purposes over the years being variously the site of mushroom farming in the 1920s, a railway control centre during World War 11, a postwar atomic physics laboratory during the early years of the Cold War and finally a garage. It was sealed off in 1968, but not particularly effectively it would seem, as in 1979 some adventurous children appeared to make their way up to Waverley, removing mail bags from platform 19 and concealing them in the tunnel. 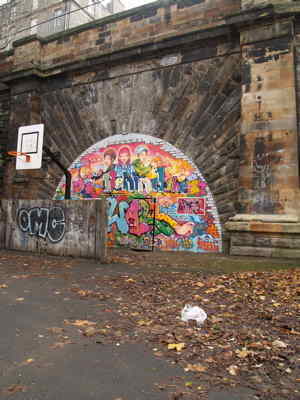 In the tunnel’s latest manifestation, in 2009, the bricked up entrance attracted the attentions of another group of young people who under the guidance of graffiti artist, Elph, painted a vibrant mural. 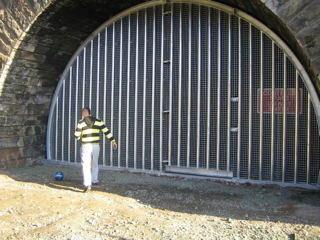 The Rodney Street Tunnel was blocked up in a more comprehensive way, effectively supporting the road above, until thanks to the efforts of the transport charity SUSTRANS it was reopened in 2009, filling a gap in the National Cycle Route. 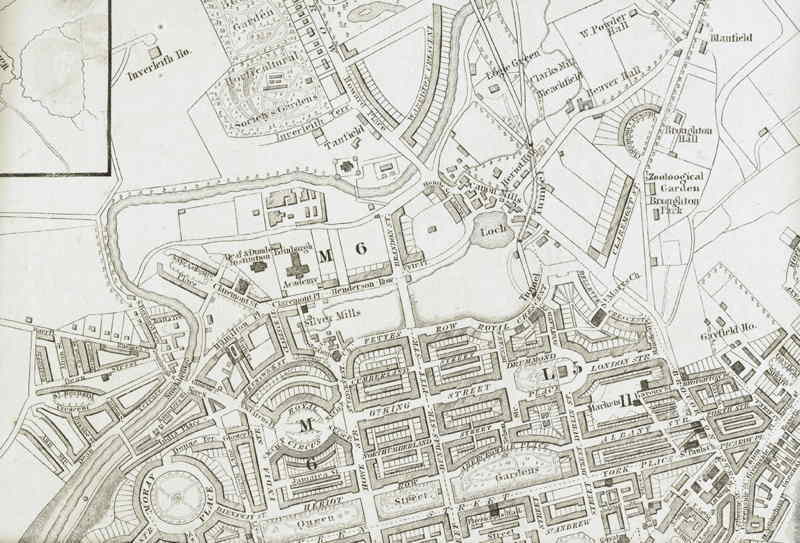 In 1860 the marshy ground of the haugh was drained and in 1865 John Cox, a philanthropist who had made his fortune out of the manufacture of gelatin, opened his Royal Patent Gymnasium. 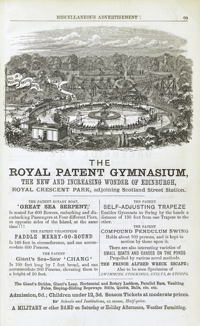 In typically Victorian fashion he wished to provide the people of Edinburgh with a facility which would afford them innocent amusement but also a means of improving their physical health and stamina, at a price which would not exclude those of modest means – one shilling for adults, sixpence for children. All the power for operating the amazing equipment on offer was to come from human bodies. There was the Giant Sea Serpent. This took the form of a large roundabout set in a circular artificial pond, held fast by wire ropes attached to a central pivot. There was a circular 6 foot wide “boat” with room for 600 seated rowers. The rowers set up an undulating motion and other passengers operated paddle-wheels. There was the giant see-saw, 100ft long by 7ft wide, pivoting on a 25ft high axle and supporting a total of 200 people, with the lighter end capable of being raised to a height of 50 ft. Tanks of water at each end cushioned the impact of the abrupt descent. The Patent Velocipede consisted of wooden framed bicycles with metal tyres which could be pedalled by a maximum of 600 people round a fixed track. A fixed wooden catwalk allowed up to 144 people to perch in leather saddles suspended by chains and use their feet to circle a central two storey glasshouse which housed spectators. There were a Compound Pendulum Swing, a couple of contraptions called Giant Strides, a trapeze, athletics equipment like vaulting poles and a pond which offered canoeing and in winter, curling and skating. Oh, for a Heath Robinson to have recorded the mechanisms of these ingenious machines. Once the ground was drained, buildings went up on the boundary with Pitt Street (now the lower end of Dundas Street) and one of these housed a swimming pool. The Gymnasium also hosted events featuring bands and on winter evenings skaters often waltzed under coloured lights. However, Edinburgh’s unreliable and inclement weather prevented the sustained level of patronage which was necessary for the long term survival of the Gymnasium and by 1879 it was sold, with St Bernard’s Football Club moving on to the site a year later. Probably incommoded by the extensive rotting Gymnasium equipment the Saints, as they were known, soon moved away. However, they were back by 1902, having won the Scottish Cup in the interim in 1895. They remained on the Gymnasium site until play was suspended for the duration of the First World War. During the war the site was requisitioned by the Royal Army Services Corps and used for parking, storing and repairing trucks and lorries and for training drivers. After the war the Saints moved back. They installed new drainage and resurfaced the ground which they realigned east-west. In 1932 a crowd of 27.000 saw them beat Hibernians 1-0. However the club struggled financially and vain attempts, like the brief introduction of greyhound racing, were made to balance the books. King George V died on 20th January 1936 and a National Memorial Fund Committee raised money to set up playing fields in his memory. The Second World War put paid temporarily to a successful outcome but finally in May 1950 the Duke of Buccleuch, the then president of the National Playing Fields Association, opened the new park which incorporated tennis courts, a putting green and a playground. This western section of the current park is held in trust as inviolate open space. 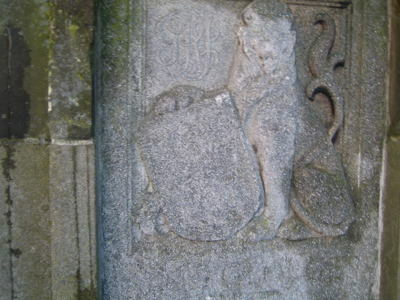 The gateposts with their bas reliefs of the lion and the unicorn and now almost illegible inscription point to the park’s royal origins. By the mid 1980s the entire park was in dire need of refurbishment – and this in a heavily tenemented and densely populated city centre with little open space available for community use. In response to concerted pressure from local residents the City of Edinburgh District Council managed to secure funding which allowed the park to be completely and imaginatively re-designed, in a manner which went a long way to meet the aspirations of all sections of the community. The NPFA designated it the best new playground of 1989. However. by 2002 the park had once again succumbed to neglect and once again local residents have adopted a proactive role, in this case by forming the Friends’ group to work with the City of Edinburgh Council for the enhancement of an invaluable community asset. In summarising the history of the park the Friends gratefully acknowledge the generous help of staff in the Edinburgh Room of the City of Edinburgh Libraries. 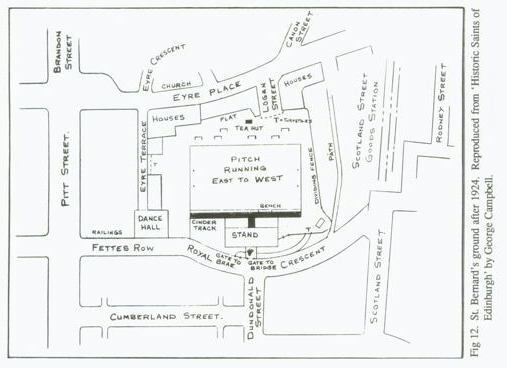 In seeking permission for use of the two sketches of St Bernard’s football pitch, pre- and post First World War, we have made every effort to trace the estate of the late George Campbell who drew them, and would be glad to hear from anyone who can point us in the direction of the heir to his intellectual property. 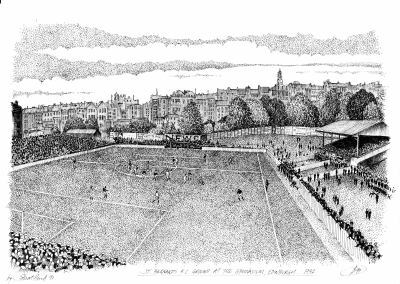 They come from his book “Historic Saints of Edinburgh 1878-1943.” George H Park has kindly allowed us to use a sketch he commissioned of the pitch in its final incarnation. His exceptionally detailed book “St Bernard’s Football Club – or when the well ran dry!” is available from georgepark@btinternet.com, with all proceeds going to the children’s cancer charity CCLASP. For an interesting account of the Scotland Street Tunnel visit the website of Subterranea Brittanica – www.subbrit.org.uk – and key in Scotland Street Tunnel Edinburgh. 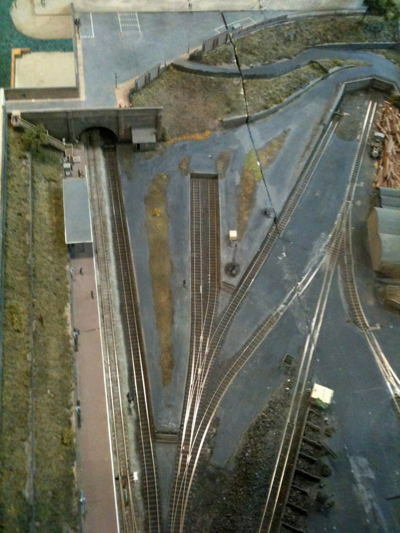 A detailed scale model of the Scotland Street Goods Yard is held in the office of CEC Community Learning and Development at Broughton High School.